A little over 45 years ago, you had a vision of a wide, beautiful tie made from Italian silk. But in the mid-60’s no one made anything like you dreamed of…… So you made your own. And people liked them. Liked them so much that they offered to buy them right off your person. You grew up a humble Jewish boy in the Bronx, with only a Hollywood-movie-inspired idea of how wealthy people really lived. You created a multi-billion dollar company based on that vision of the privileged life, and brilliantly marketed it to the world. From that first line of ties, to suits, to women’s wear, to fragrances, to children’s clothes, and to everything a house could ever need. Now your name is associated with the elite that you wanted to emulate as a young man. When I was only 14, I knew you would have a pretty big impact on my life……I had no idea just how big. I just bought the BIG coffee table book Ralph Lauren! I’ve been wanting it for awhile and decided to just jump off and buy it! 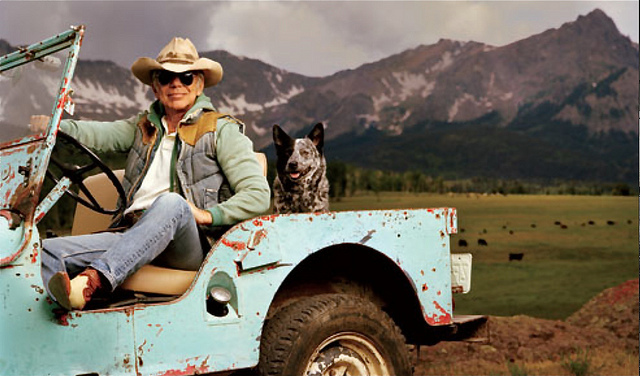 I love all things Ralph Lauren! Clothes to home my all time favorites! Thank you for your post today. Happy Birthday Mr. Lauren! Hi Betsy, I have that book too, love all those add campaign pictures! Pretty impressive 45 years of work he’s had….. Thanks for reading! Well done James, well done! Love the Birthday wishes. School House Electric & Supply Co.
Look Ma!!! I made the Aspen Daily News!!! Just like Hunter S Thompson. Although I doubt he was ever captured “man-handling” a mannequin! HA!!! Not exactly the state I want to be in right now.,,,, but it’s progress.